How to compare financial aid award letters from different schools? What types of money does and does not need to be paid back? What are your options if the financial aid doesn't cover all your expenses? Enter your tuition/fees and other expenses directly from your financial aid award letter. Undergrads working toward a first bachelor’s or professional degree may qualify for a Pell Grant. Graduates enrolled in a teacher certification program may be eligible, too. What’s required: a demonstration of strong financial need, U.S. citizenship, a clean legal record, and ongoing academic progress. Students of a parent killed in military duty in Iraq or Afghanistan, or students with certain intellectual disabilities, may qualify for Pell Grant funding. As you know, there are hundreds--thousands--of scholarships available, with a lot of competition for the biggest ones. Keep an eye open for smaller awards that could add up to significant cash for college. When you write an application essay, be sure to personalize it with a story that will help you stand out. Be sure to follow instructions precisely and observe the deadline. Proofread your essay to ensure it reads well--and to prevent any silly grammatical mistakes that could automatically disqualify you. Federally-funded work study helps students get part-time jobs to help pay for college. Part-time and full-time undergraduates are eligible, but you must demonstrate some level of financial need via your Free Application for Federal Student Aid. Your financial aid letter from schools you’ve applied to will include the grants, scholarships, student loan amounts, and work-study amounts you’ve been awarded. These are a special type of loan awarded directly from your college, based on a tougher standard of financial need. Funds are limited from each individual school. Perkins loans have a slightly higher interest rate than subsidized or unsubsidized undergraduate loans. You’ll be told if you qualify after filling out the Free Application for Federal Student Aid. Subsidized student loans don’t accrue interest while you are at least a half-time student or during other allowed repayment breaks. These loans are only available to undergraduate students and are based on financial need. Financial aid packages may include a combination of subsidized and unsubsidized loans. Unsubsidized loans are available to both undergraduate and graduate students. Interest always accrues, regardless of whether you get an excused repayment break or are on an income-driven repayment plan. Unsubsidized loans do have borrowing limits but they don’t have income limits for qualifying. When borrowing for your child's education, parent PLUS loans are an option. They are designed to fill in funding gaps after all other federal financial aid is awarded. These are federal education loans that have a higher interest rate than loans issued directly to students. Private student loans are also an option to cover unmet college costs. These are offered by banks and independent lending institutions, which have their own requirements for approval and individual interest rates, loan limits, processing fees and repayment conditions. 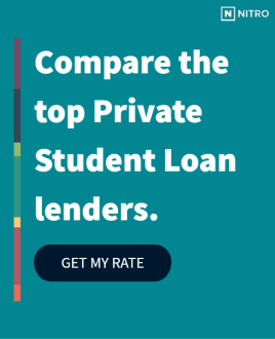 To get a private student loan, you must apply for the loan with a specific bank or financial institution. To help you qualify for a student loan, a parent, spouse or family friend can co-sign the student loan application with you. Your co-signer agrees to share the responsibility for repaying the loan if you are unable to make those payments. Getting the money you need for your education is easier than you might think. And the good news is we have 4 featured lenders for you to check out. No origination costs. Apply in less than 15 minutes.